As a single mom, movies don't normally fit into the budget, so when I had the opportunity to take my son to a pre-release showing of How To Train Your Dragon 2, I jumped at it. My son loves movies and he particularly enjoyed How To Train Your Dragon. I wasn't concerned with any of the content in the original, so I wasn't concerned about seeing the sequel without a review from Addison. My son enjoyed the experience, but I left with re-affirmation that foster adoptive parents must preview or find adoption specific reviews before viewing any film with a foster or adoptive child, even when it seems like it should be "safe". As a mom (not as a movie reviewer) and maybe as a therapist that specializes in adoption two things stuck out to me. 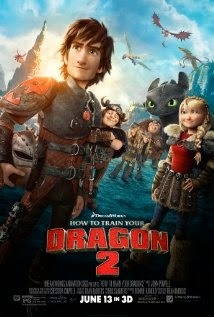 Near the beginning, while Hiccup is trying to talk to his father, one of the 'pet' dragons makes a mistake and is told "you're going to be put up for adoption". This is kind of in the background and I do not think my son noticed; but of course it got my attention, and I was dismayed. I am not a fan of the overuse of the word adoption and how it can confuse children and lead to false perceptions about adoption. (link to http://www.brooke-randolph.com/Blog/Dont_Adopt_This_Holiday_Season) A threat of being removed from the family as a result of a mistake can exacerbate feelings and fears of children who believe that they were the cause of separation from birth/first family through their behavior. Children make mistakes. A threat of separation from family for a mistake - even a major infraction - is frightening and inappropriate for any child, whether he or she had already experienced such a separation or not. For the children who have been separated from family for any reason in the past, such a joke phrase can be an emotional trigger. Hiccup is dealing with identity issues as part of the plot, something to which many who have been adopted can relate. He attributes this identity crisis to never knowing his mother, whom everyone believed had died when she was taken away by a dragon. Hiccup's mother unexpectedly finds him, and they discover that they are very much alike. I have concerns about how this can complicate fantasies that birth/first families will return. These types of fantasies are understandable and part of how children process adoption. As presented, the film suggests that even death is not final and anything is possible. There is a nearly perfect family reunion in the movie, but in reality reunions are often complicated by a variety of personality factors and issues. Reunions are rarely as simple as "they lived happily ever after." In true Disney fashion, Stoic, Hiccup's father is killed before they can return home together as a reunited family. I cannot decide if this detail is helpful or not to a child's processing of the film in relation to adoption issues. While the first reference was disappointing to me, I wished I would have had some warning regarding the plot twist. For me this affirmed the importance of this site and Addison's work. While I may not budget for the theater frequently, when my dad wants to take my son to a movie, I read Addison's reviews. A movie theater creates an intensified sensory and emotional experience through the large dark room, surround sound, and bigger than life screen. It is a place where emotional separation becomes more difficult. Adoption triggers can pop up anywhere at any time. Adoptive parents have to be ready to address inappropriate comments and answer questions for their children at any time. Yet if I can avoid triggers in a movie theater where they can potentially be more powerful, I want to do that for my child. When reviews suggest that there may be something emotional or intense in a film, I am much more likely to wait to watch it together at home than view it in a theater. Bio: Brooke Randolph, LMHC, is a parent, therapist, and adoption professional with more than 20 years of experience working with children and families. She is a private practice counselor in Indianapolis, Indiana; the Vice President of PR, Outreach, and Communications at KidsFirst Adoption Services; and the mental health expert contributor at DietsInReview.com, a national diet and fitness column. She was a founding member of MLJ Adoptions, Inc., where she served as the VP of Social Services for seven years. She adopted an older child internationally as a single woman, which she considers one of the most difficult and most rewarding things she has ever done. She has authored adoption education materials and presented at numerous conferences and workshops throughout North America. Brooke is primarily motivated to encourage, equip, and empower parents and individuals to make changes that strengthen their lives, their careers, and their families.